For more classic Persian foods, pop in next Thursday, as a group of us Iranian food bloggers have arranged a Persian Food Round Up on the occasion of Mehregan. On Oct. 9th, we will post some of the best Fall related Persian dishes with the hash-tag #Meregan2014. On each post/blog you will find links to all of the other posts around the world. 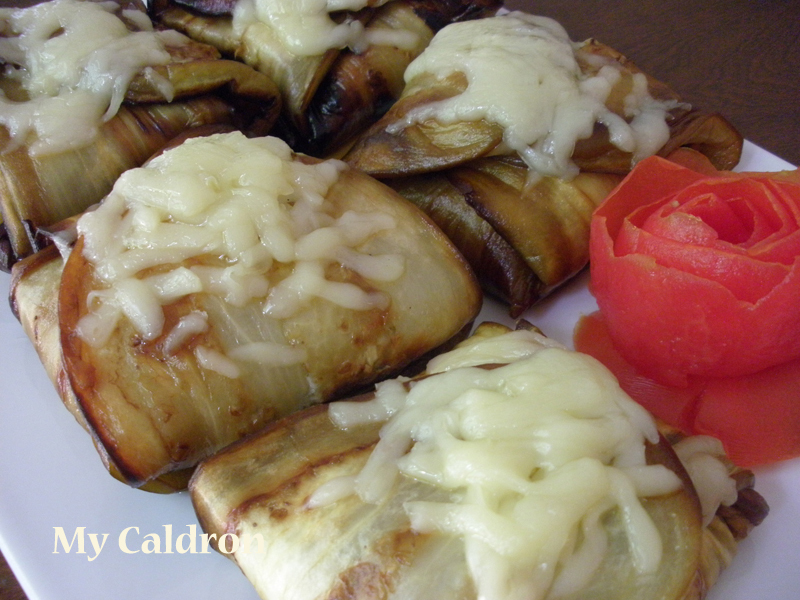 Skin eggplants and slice each eggplant lengthwise about ½ cm. Sprinkle 2 tbsp. salt, rinse and leave in a colander for 1-2 hours. Pat dry completely. 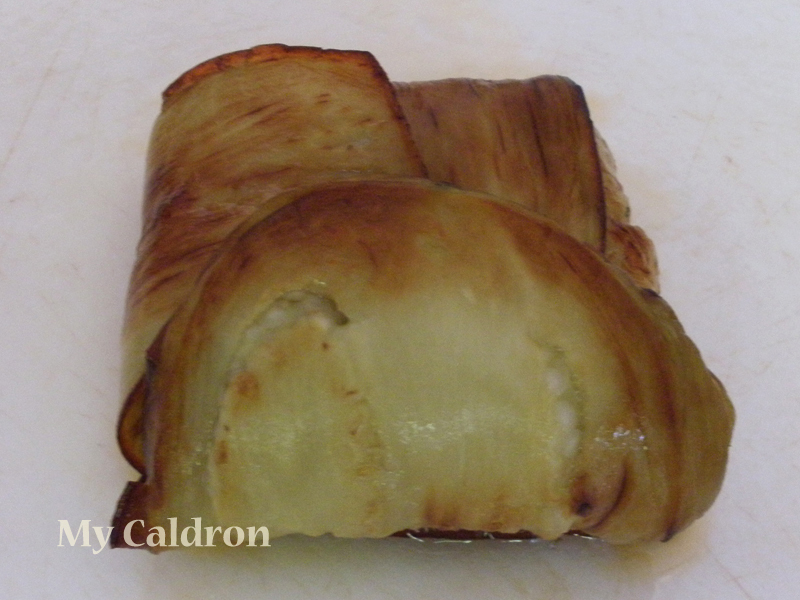 Fry eggplants on both sides in hot oil over medium heat until they are light brown. Remove each slice gently from the frying pan and place in a large metal colander or on paper towel to take as much excess oil as possible. Heat 1tbsp. cooking oil in a frying pan and stir-fry onions (always over medium heat) till golden brown. 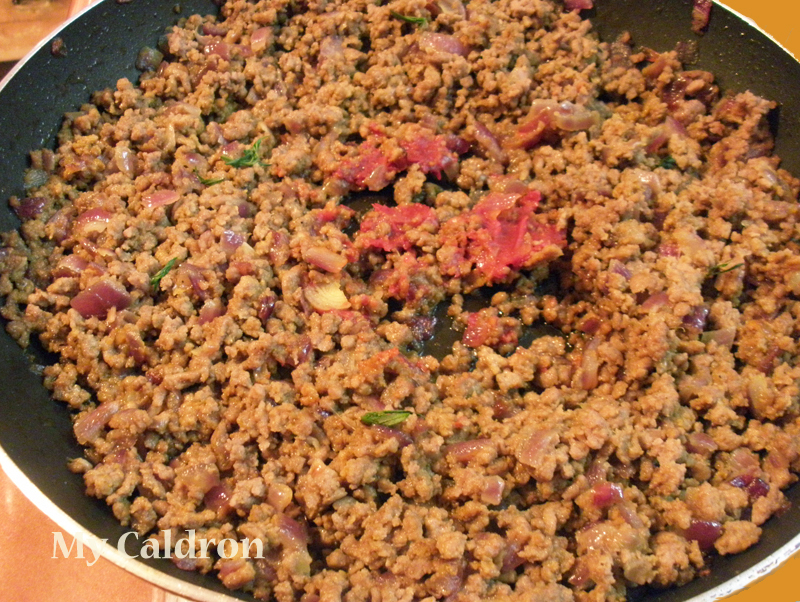 Add ground meat and fry for ten minutes until brownish; stir constantly to separate the meat in smallest bits possible. Add turmeric, salt, pepper, and mix well. This is pretty much the basis and you could add a vegetable or two of your choice (such as minced garlic, mushrooms). I also stirred in tomato paste and at the very end, some chopped parsley. Place two slices of fried eggplants in plus + shape. Spoon some ground beef mix in the middle. Wrap the eggplants ends around the stuffing to form a perfect cube. 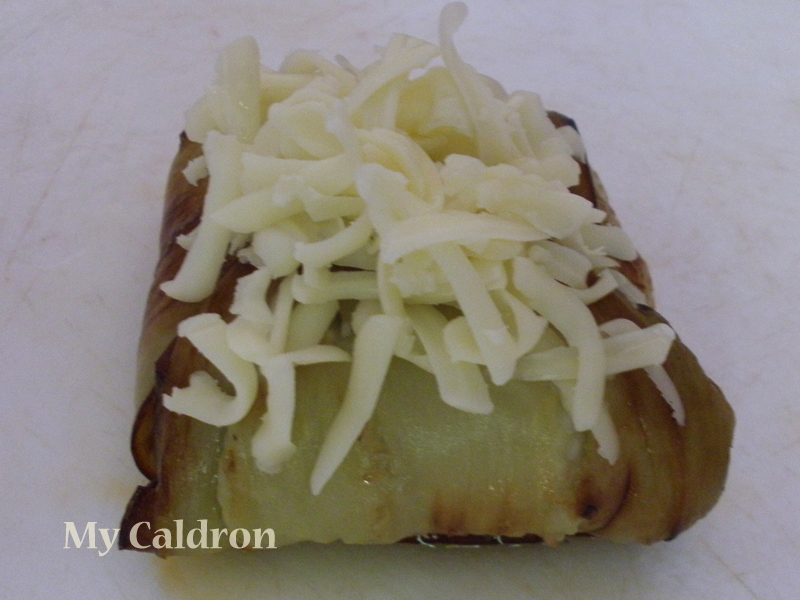 Cover the top of the wrap with grated cheese. 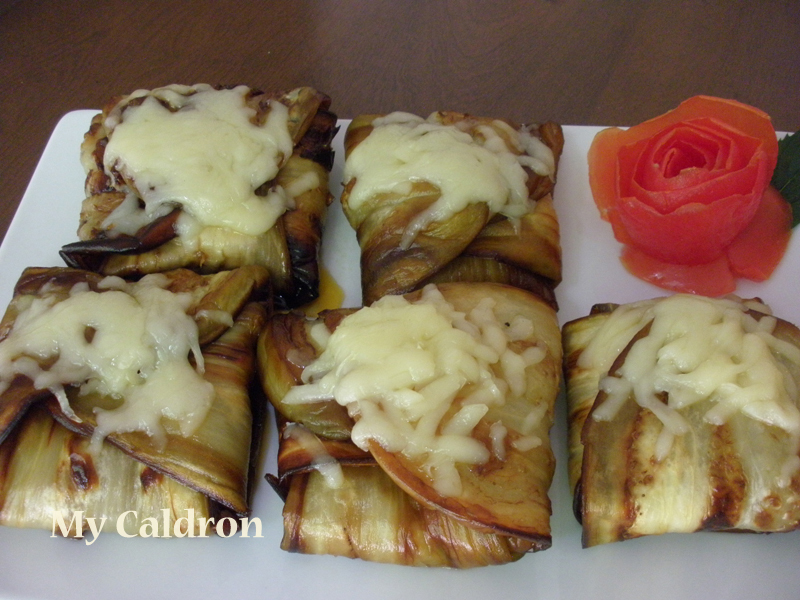 Heat the oven to 250 F. Place an aluminum foil on your baking sheet and arrange the wraps on it and place in the oven for 10 minute, or before the cheese melts completely. PS: In case, you, like my dear, foodie-but-not-much-of-a-cook husband, is wondering that rose next to the wraps is not artificial nor is it a candle! It is made of tomato skin and here is how you can do it. 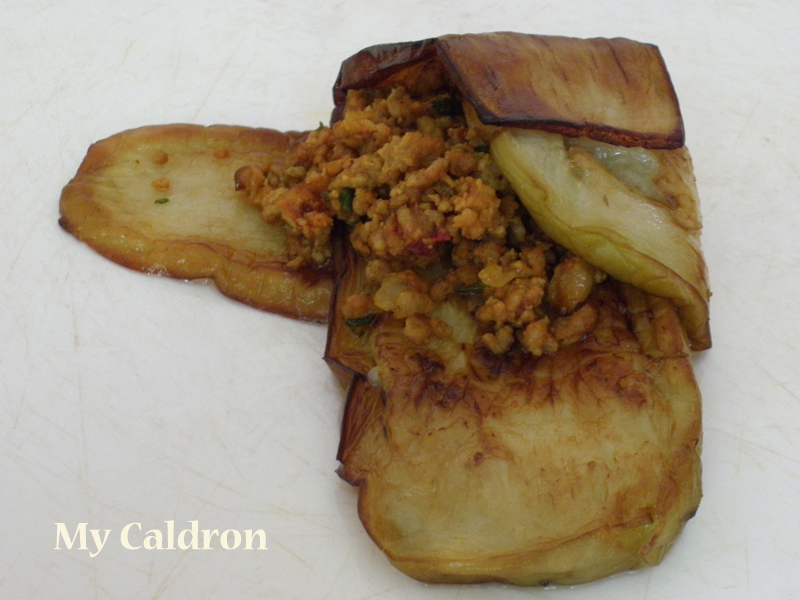 This is such a creative way to use eggplants! Looks awesome and I bet is delicious! I don’t have it detailed here, but I do make it for my vegi friends sometimes by replacing ground meat with diced and slightly fried portobello mushroom.